(HealthDay)—Researchers say they have identified three criteria that suggest an extremely premature infant has a low risk of developing sepsis, which might allow doctors to spare these babies early exposure to antibiotics. But it isn't always easy to tell if these very small babies are sick due to an infection such as sepsis, or because their tiny bodies are so underdeveloped. "These babies can die very quickly of sepsis, which makes it very difficult to choose who really needs antibiotics," said Dr. Rick Stafford, director of neonatology at Northern Westchester Hospital in Mount Kisco, N.Y. Stafford was not involved in the study. At the same time, doctors are trying to reduce the use of unnecessary antibiotics, because when antibiotics are given to someone who doesn't need them, it increases the risk of developing bacteria that will resist those antibiotics in the future, Stafford explained. Right now, he said, close to 90 percent of extremely premature babies may be exposed to antibiotics in the hospital. To see what factors might help identify babies with a low risk of infection, the researchers considered ways that babies get infections in the first place. Most infections come from the mother's uterus or the vaginal canal, according to the study. So the researchers hypothesized that babies born by cesarean section, whose moms had no signs of uterine infection and who hadn't had their water break, would be at low risk of early onset sepsis. 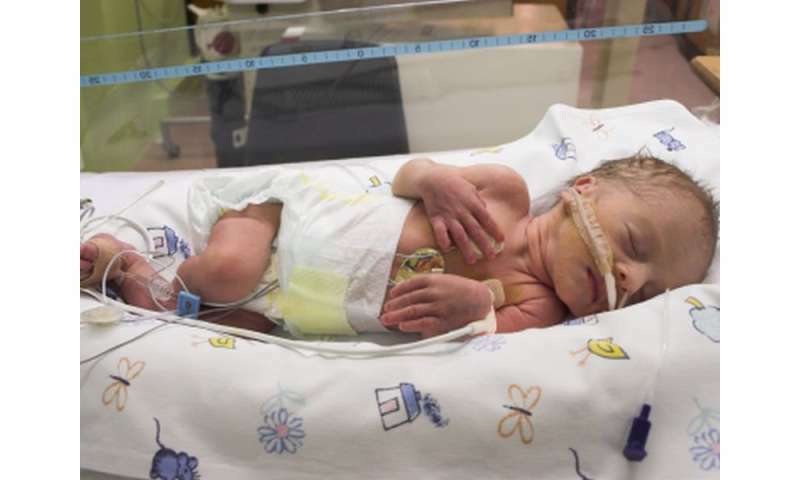 The investigators then looked at a large database of more than 15,000 extremely premature infants born between 22 and 28 weeks of gestation (normal-term babies are born at 39 to 40 weeks). Almost 5,800 (37 percent) of these preemies met the low-risk criteria. The rate of sepsis was 0.5 percent in the low-risk babies and 2.5 percent in the comparison group, the study showed. "Knowing how to use antibiotics properly is something physicians struggle with because antibiotics have their risks and their benefits. But if you're uninfected, you're only getting the risks," said study author Dr. Karen Puopolo. She's an associate professor of pediatrics at Children's Hospital of Philadelphia and chief of newborn care at Pennsylvania Hospital. "We found a significant difference in culture-confirmed infections between the low-risk and the comparison group—about a 70 to 80 percent lower risk," Puopolo said. What's more, the researchers also found that the low-risk babies had a higher risk of certain long-term complications if they were on antibiotics for five or more days. Low-risk babies given prolonged antibiotics were more likely to develop serious fungal infections, to develop a serious lung complication, and they even had a higher risk of dying compared to the comparison group. "With all these pieces of evidence, maybe antibiotics aren't always the safest thing to do," Puopolo said. However, both Puopolo and Stafford said it will likely take some time before there's a significant change in practice. And both said these findings need to be confirmed in other studies. "Antibiotic use is hard to avoid in this population," Stafford said. "But this may get everybody to be much more critical in our thinking." Puopolo said: "Ours is not the first dataset to show what we've always believed and what we've always done isn't working as expected. In the end, there were worse health outcomes." She suggested that if a baby is low-risk, a doctor could try withholding antibiotics. "It's a decision you can always change two hours later," Puopolo pointed out. The study was published online Oct. 5 in Pediatrics. Learn more about sepsis that occurs after birth from the U.S. National Library of Medicine.